Then I remembered how it used to be for me when I was a kid, and everything was clear and I was happy so much of the time chasing lizards, catching rattlesnakes, and all the other things we used to do in the Texas panhandle to entertain ourselves. I was a wild animal, free, and exploring everything. I wanted it back. I knew that when I had been involved with Nature, that I always had felt good. And now here I was, not involved with nature at all! I wanted to fix that. I decided that from there on, I would make time each day to get out into Nature to appreciate and admire it and to find out about how Nature did things in my home, now in Maryland. I started out into the wilderness as soon as I reached my car, and spent at least one hour, in each and every day, exploring Nature where I lived. I have been doing this since 1983. The next event in the sequence was when I decided I wanted to find out for myself the answer to the question "Is there God?" In my scientific way, in order to find out the facts about this, I wanted to be sure that I entertained no prejudices on the topic. To accomplish the condition of having no prejudices, so as to find out for myself, through my own experiences, observations, and experiments, the answer to the question, I went through several years of eliminating all my socially inherited prejudices in the areas of philosophy and religion. I needed to start from a perfectly clean slate on the topic to arrive at the truth. The experiencable truth. The facts, at first hand. So, I did that. I threw out everything I had ever heard about any religion or philosophy. All of them. Every bit of it. Then I started exploring, perfectly on my own resources, for the answer(s) to the original question. At the end of the next five years, I had found what I was looking for, at first hand. That was just the first answer. Then, of course, many new questions arose due to my discoveries, each of which I began to find out about in the same way I had done with the first question. Years later, I took my head out of the water of my individual and very private researches, and looked about to see if any other person on the face of the earth had ever found such things. The Taoists, the Buddhists, Jainism, Shintoism, Judaism, Hinduism, Gnostic Christianity, etc., all had small segments, bits and pieces, fragments of what I'd found out. But none of them had all of it. What surprised me the most, was when I discovered that the Indigenous Spiritual Practices of all the Native peoples, the world over, reported exactly the same experiences and results that I had had. I was amazed! And relieved to know that I was not the only one who had found these things. So, the way the world is, the way things actually are, is not in accord with any of the major religions. None of them. Now, rather than debate this statement with you, I'd rather you find out for yourself, what the truth is, what the facts are, through your own experiences and explorations.In this regard, I draw your attention to the "Basic Practices" of Harmony Dynamics. These practices will give you the same results I had after years of painstaking explorations and discoveries and insights, in a very short time, through your own experiences. What happens when you do these practices, is that you have many amazing experiences for yourself. These results may well expand your understanding of your religion, whatever it is. Just let what will happen for you speak for itself, and then go on to explore the vast array of experiences and wonders that will arise for you as you do these practices regularly over years of time. The more you do these, the more results you get, the more wonders you behold. So try these practices and explore for yourself what happens and what you see, as a result of doing these practices, exactly as written. And please enjoy the many worlds around you. Soul Awareness and the Heart Thought (R. N. Boyd) -- "When you exclusively focus your attention on your various perceptions and senses, not allowing any attention for the intellectual thinking, the intellectual thought eventually turns off, and a new kind of thought eventually arises, with continued and devoted practice, which we may call "the heart thought", or "Soul Awareness", or "Transcendent Thought"." Divine Way of Spiritual Heart (Vladimir Antonin, Ph.D.) -- Contemporary knowledge about God, Evolution and the meaning of life. Methodology of spiritual self-perfection. Critters -- This section talks about the amazing intellectual and telepathic and spiritual abilities of the various creatures. There have been some really good recent studies done on animal intelligence, which prove that they are at least as smart as some people. Amadora -- Powerful spiritual artforms from extra-dimensional sources. Bob Dratch and the CB Tool - "One may find that one no longer needs to buy another apparatus to "play with or work with fields" if one has this software running on one's computer." 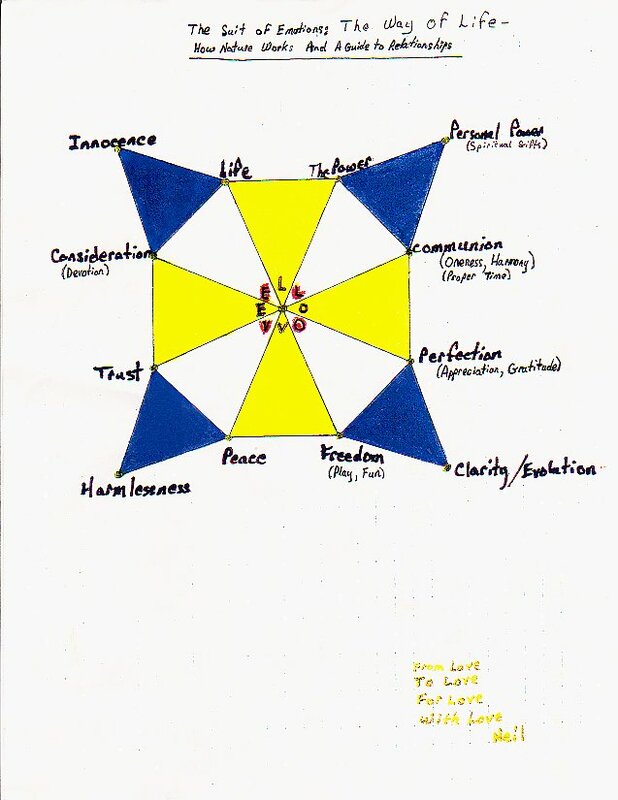 Freedom Series -- A Harmony Dynamics (TM) Method, (c) J. Dufour and R. N. Boyd -- A technique to achieve deep appreciation of the uniqueness of all life and the freedom to express your own uniqueness is the key to vanishing addictive behaviors, substance abuse, fixated roles and culturally programmed identities. These are poor substitutes for the magnificence of who You really are. Freedom Series -- Suit of Emotions (80K graphic used with Harmony Dynamics) -- Note: For more information on the Freedom Series or Harmony Dynamics method, or to arrange a session or workshop, please contact Robert Neil Boyd at Email. Harmonizer Device - The Harmonizer will act to erase any influence you wish to counteract. Mindsong Incorporated -- Mindsong is a computer peripheral device based on the Schroedinger equations which makes your computer telepathic. This is an archived website. This technology is no longer available through this website. The Penetrating Insight (R. N. Boyd) -- Descriptions of the Discovery, Merging Vision, and Soft Vision exercises which are designed to increase awareness and perceptions of the spirit worlds. "If you practice Soft Vision long enough, and combine it with the Penetrating Insight, and the Merging Vision, and maintain your emotional sensitivity, you will discover how to perceive other universes and dimensions and worlds." RI 2400 CD -- A program for interfacing between PCs and radionics devices. Note that this is an archive - the technology is probably no longer available through this website. Tools for Wellness -- Resources for alternative health products and information. Distributors of Safe Space technology. 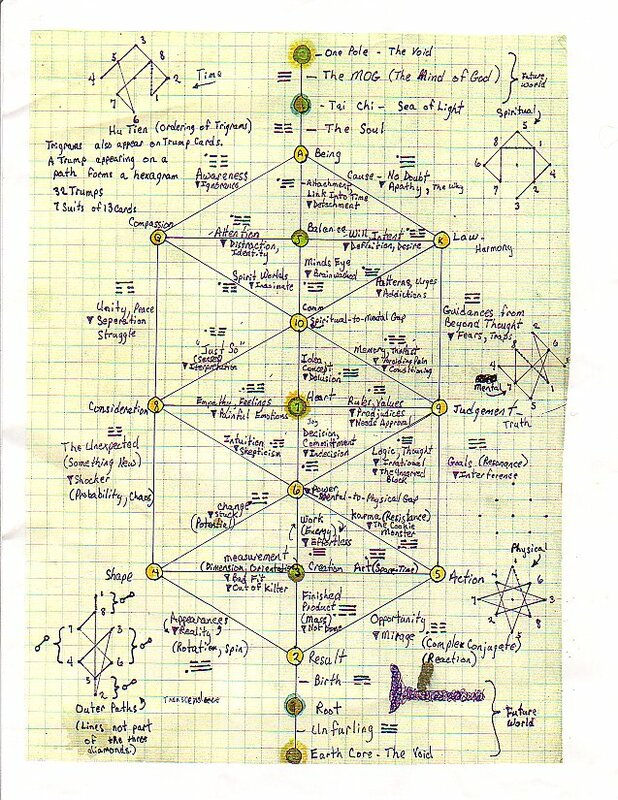 Tree of Life and I Ching Trigrams (200K graphic) -- 32-sphere tree of life, with each path between spheres related to an I Ching trigram (R. N. Boyd). Fabrics of Consciousness, The (R. N. Boyd) -- First published in ITC Journal, No.11. Enformy (Don Watson) -- If you're curious about enformy, Systemics, consciousness, self-awareness, holism, organization, life per se, or the mind-body problem, check out these articles. The Field (Lynne McTaggart) -- "The Field has been called a book that could change the world forever. The Field tells the story of a group of frontier scientists who discovered that the Zero Point Field - an ocean of subatomic vibrations in the space between things - connects everything in the universe, much like the Force in Star Wars. The Field offers a radically new view of the way our world and our bodies work. The human mind and body are not distinct and separate from their environment, but a packet of pulsating energy constantly interacting with this vast energy sea. The Field creates a picture of an interconnected universe and a new scientific theory which makes sense of 'supernatural 'phenomena." Institute of General Semantics -- Since its founding in 1938, the IGS has promoted and taught Alfred Korzybski?s non-Aristotelian system, general semantics. The formulations of the system give us tools which enable us to improve our evaluations so that they more closely correspond to what is going on. International Consciousness Research Laboratories, Inc. -- A nonprofit consortium of investigators dedicated to exploring Consciousness. Opening To The Infinite: Human Multidimensional Potential (Alice Bryant and Linda Seebach, M.S.W.) -- A very(!) interesting book! Neurosync Behavior Modification Software -- Software that changes behavior using subliminal input. Princeton Engineering Anomalies Research -- Scientific Study of Consciousness-Related Physical Phenomena. Rigorous scientific study of the interaction of human consciousness with sensitive physical devices, systems, and processes common to contemporary engineering practice. Robert Anton Wilson's website -- "I seem to be a verb..."
Superpowers of the Human Biomind -- "Put simply, for there is no other way to put it, the superpowers of the human biomind are defined as those indwelling faculties of our species which can transcend space and time as one major category of activity, and energy and matter as another major category." Ingo Swann's website. Topological Geometrodynamics -- TGD inspired theory of consciousness (Matti Pitk?nen's website). uri-geller.com - Uri Geller's site -- I think that spoon bending is an expression of the Creation Aspect of the Soul of the human Being, and is not directly attributable to the mental form of "will power". Spoon bending also requires establishing a rapport with the consciousness of the spoon, it seems to me. For more examples of spoon and fork-bending, see http://www.fork-you.com/ and Uri Geller's spoon-bending essay.